A survey of several of North Carolina’s leading newspapers over the weekend, produced several fine opinion page finds, including Gene Nichol’s latest skewering of GOP gerrymandering and the Charlotte Observer’s takedown of North Carolina Congressman Mark Walker and his unwitting admission of conservative Capitol Hill hypocrisy on tax policy. “Fetzer, Goolsby, et al., took umbrage that Spellings didn’t ask them please before that letter was dropped in the mail. 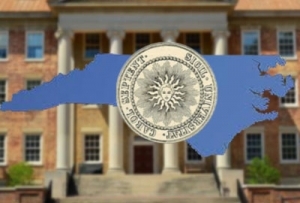 Then came a contentious board meeting, in which the new majority bloc put forward a number of resolutions, including reviewing the size of Spellings’ staff, cutting tuition and moving the university president’s office to Raleigh or the Research Triangle — any place, it seems, other than Chapel Hill, where it presently is. Moving the university system’s management out of Chapel Hill would be extremely expensive (as a few governors pointed out) and would serve no good purpose — other than sticking it to ‘Pinko Hill,’ as the late Jesse Helms used to call it.